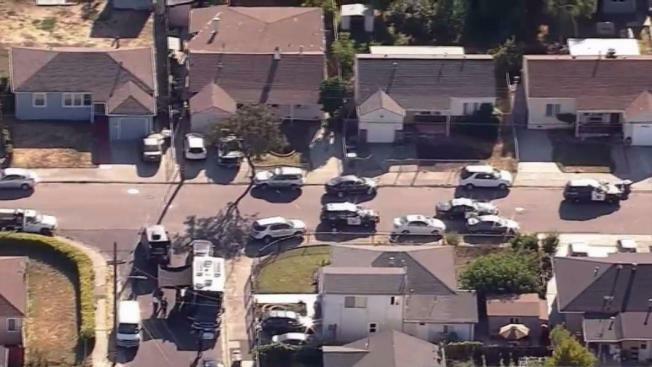 Police arrested two suspects in a San Leandro drive-by shooting late Thursday after a massive manhunt that involved a shelter in place in a residential neighborhood. Patrol officers, K-9 units, SWAT teams and a helicopter were in the area of Arthur Avenue, Jean Way, Midway Avenue and North Boulevard, as two suspects remained at large after shooting into an occupied vehicle, police said. Police initially said they were searching for at least three suspects. Earlier Thursday, the suspects drove up to an occupied vehicle and opened fire, police said. Two people in the occupied vehicle suffered non-life-threatening wounds, they said. The suspect vehicle was pursued into the neighborhood, where the suspects bailed on foot, police said. The residential neighborhood is near the junction of state Highway 112 and Interstate 880. The shooting occurred near Davis Street and Douglas Drive, police said.